U.S. stock futures turn mixed on Tuesday, after rising earlier as investors cheer the move by U.S. lawmakers to end a three-day shutdown of the federal government. U.S. stock futures turned mixed on Tuesday, Jan. 23, after rising earlier as investors initially cheered the move by U.S. lawmakers to end a three-day shutdown of the federal government and reacted to an upgrade in global growth estimates from the International Monetary Fund. Stocks jumped to new records on Monday, Jan. 22, after the Senate reached agreement on a deal that would end the shutdown. The Dow Jones Industrial Average finished up 142 points, or 0.55%, to a record high of 26,214.60. The S&P 500 gained 22.67 points, or 0.8%, to 2,832.97, while the Nasdaq rose 71.65 points, or 1%, to end Monday at 7,408.03. The IMF on Tuesday issued fresh economic growth upgrades, lifting its global GDP estimate for this year and next to 3.9%, citing the near-term impact of last month's $1.5 trillion U.S. tax reform bill. The economic calendar in the U.S. on Tuesday includes the Richmond Fed Manufacturing Index for January at 10 a.m. ET. 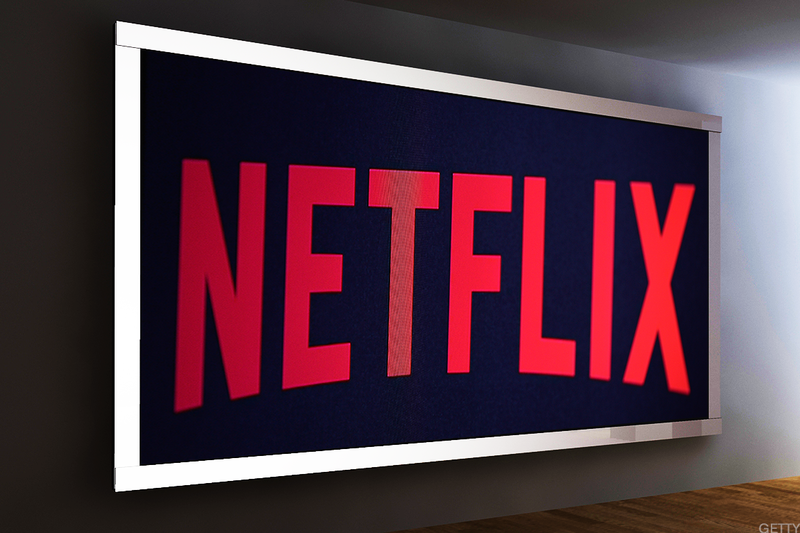 Shares of Netflix Inc. ( NFLX - Get Report) jumped 9.7% in premarket trading on Tuesday to $249.60 after the streaming giant posted subscriber growth that again exceeded expectations. For the quarter, Netflix added 8.33 million net subscribers, of which 6.36 million were international (compared to Netflix's guidance of 5.05 million), and 1.98 million in the U.S. (above guidance of 1.25 million). Quarterly revenue of $3.29 billion was slightly above estimates of $3.28 billion, while earnings of 41 cents were in line with Wall Street's predictions. Netflix also said it would increase its spending on content -- including original productions -- to $8 billion this year, a move that lifts its total commitment to around $18 billion. Netflix also will increase its marketing budget to around $2 billion. The rise in Netflix's stock price will take the company's market capitalization past $100 billion for the first time. Earnings are expected Tuesday from four Dow components: Johnson & Johnson (JNJ - Get Report) , Procter & Gamble Co. (PG - Get Report) , Travelers Cos. (TRV - Get Report) and Verizon Communications Inc. (VZ - Get Report) . J&J reported fourth-quarter adjusted earnings of $1.74 a share, 2 cents above estimates. The stock rose 1% in premarket trading. Procter & Gamble earned $1.19 a share on an adjusted basis in its fiscal second quarter, topping forecasts, and said it expects fiscal 2018 adjusted per-share earnings growth of 5% to 8% vs. prior projections of 5% to 7%. P&G shares fell 0.3% in premarket trading. Travelers posted core earnings in the fourth quarter of $2.28 a share, beating estimates of $1.50 from analysts surveyed by FactSet. Verizon rose 1.1% in premarket trading after posting fourth-quarter adjusted profit of 86 cents a share, missing forecasts by 2 cents. Revenue of $34 billion, however, topped Wall Street's estimates. Reports are also expected from United Continental Holdings Inc. (UAL - Get Report) , Kimberly-Clark Corp. (KMB - Get Report) and State Street Corp. (STT - Get Report) . Shares of First Solar Inc. (FSLR - Get Report) were jumping 4.1% in premarket trading on Tuesday after the Trump administration imposed 30% tariffs on imported solar-energy cells and modules -- the latest sign that the president is playing hardball with China, which dominates the sector. The administration also slapped tariffs on foreign-made washing machines. "The president's action makes clear again that the Trump administration will always defend American workers, farmers, ranchers and businesses in this regard," U.S. Trade Representative Robert Lighthizer said in announcing the move after markets closed on Monday. Shares of U.S. washing machine maker Whirlpool Corp. (WHR - Get Report) rose 3.2% in after-hours trading on Monday after the administration said tariffs for large residential washing machines will start at up to 50% and phase out after three years. Britain's Competition and Markets Authority said Tuesday that 21st Century Fox Inc.'s (FOXA proposed takeover of SKY PLC wasn't in the public interest, a decision that not only puts the $15 billion deal on ice but also adds a new layer of complication to Rupert Murdoch's sale of his U.S. media assets to Walt Disney Co. (DIS - Get Report) . The regulator, which has been examining the deal for several months, said that its decision was based on the impact the purchase would have on "media plurality" in the United Kingdom, given the dominance Fox would have over the domestic media landscape and the fact that Murdoch Family Trust assets are watched and read by a third of the population. "Due to its control of News Corp (NWSA - Get Report) , the Murdoch family already has significant influence over public opinion and full ownership of Sky by Fox would strengthen this even further," the CMA said. "While there are a range of other news outlets serving U.K. audiences, the CMA has provisionally found that they would not be sufficient to moderate or mitigate the increased influence of the MFT if the deal went ahead." Fox said it was "disappointed by the CMA's provisional findings" on media plurality but said it would continue to engage with it ahead of its final report later this spring. This article has been updated to include earnings from Verizon, Travelers and Procter & Gamble.